Newly-appointed member of National Commission for Women Soso Shaiza calling on the Minister of State for Development of North Eastern Region, Dr. Jitendra Singh, in New Delhi on December 3. Photo credit :Northeast Now. With an effort to empower women from Northeast, the National Commission for Women (NCW) has decided to support Northeast livelihood programmes for women, particularly for those in younger age group, through skill development and specialised training. 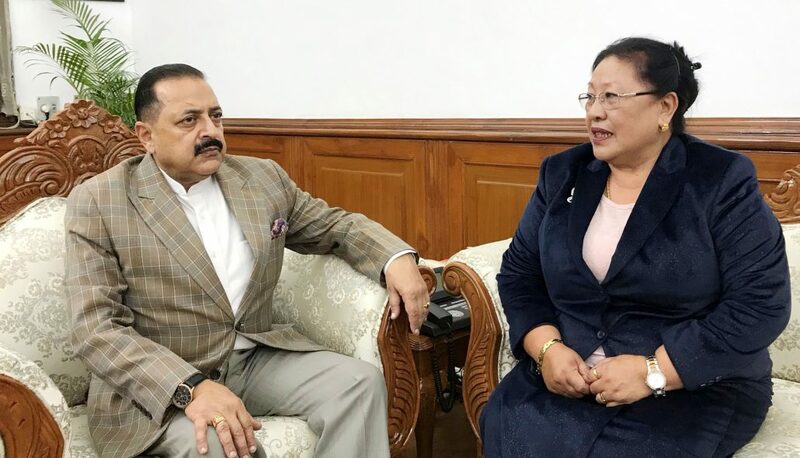 The decision was taken following a meeting between DoNER Minister Dr Jitendra Singh and the newly-appointed member of the three-member National Commission for Women, Soso Shaiza. “There was a huge scope for raising the levels of education among the women living in remote and rural areas, and also to impart skill training to make them self – reliant,” a government official said. The DoNER Minister said that the National Commission for Women could supplement its efforts and resources in carrying forward several of the women oriented projects which are already undertaken by the Ministry of Development of North-eastern Region and the NEC. The issue of Northeast women, particularly of younger age groups, living in metros like Bengaluru and Mumbai was also discussed. Dr Singh informed Shaiza that the construction work of an exclusive hostel in Bangalore University campus for girl students from Northeast is almost complete and the entire project has been funded by North Eastern Council and DoNER Ministry. He also informed that the upcoming hostel for Northeast students at the Jawaharlal Nehru University (JNU) will include accommodation for 200 girl students.